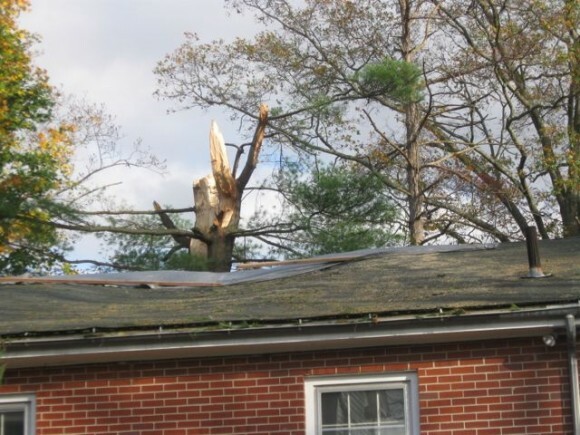 Tree damage to the roof of Ivoryton Post Office (photo by Jerome Wilson). AREAWIDE— Region 4 schools will remain closed Thursday and Friday, as John Winthrop Middle School in Deep River continues to be used as an emergency shelter for residents of the district towns of Chester,Deep River and Essex. In another development in the wake of the arrival of Hurricane Sandy Monday, the Ivoryton Post Office has been closed after a large tree fell on the building’s roof and caused extensive damage. The building is expected to remain closed for up to a month. Superintendent of Schools Ruth Levy announced the school closing Wednesday afternoon. District schools have been closed since the arrival of the storm Monday, making for a full week of missed classes due to Hurricane Sandy. Levy said the emergency shelter at the middle school is expected top remain open through Friday. Though some sections of Deep River and the Ivoryton section of Essex had electric power restored overnight Wednesday, large sections of Deep River, Chester, and Essex remain without electricity. Only portions of the Centerbrook section of Essex were spared outages from the storm. Levy said about 500 meals were served to residents at the middle school cafeteria Tuesday, with at least 30 people staying overnight at the shelter. Dozens more used the shower facilities at the school. Levy said the school district is paying most of the costs of the emergency shelter in anticipation of later reimbursement from the Federal Emergency Management Agency. A costumed Halloween parade was held at the middle school Wrednesday afternoon after traditional Halloween activities, such as the parade in Essex, were cancelled. The Ivoryton Post Office is closed after a large tree fell during the storm and breached the roof of the structure. A postal employee said Wednesday the 275 boxholders at the Ivoryton facility will be able to pick up mail at the Centerbrook Post Office using there regular postal box numbers. The Ivoryton Post Office, which was built in the 1960s, is expected to remain closed for up to a month for repairs to the building’s roof. I just received word that schools will be closed for the remainder of the week. Please help spread the word. The AlertNow system suffered a failure that prevented our administrators from getting communications out to all of you. I am told it is now back up and running so you should be receiving notifications through there shortly. We will certainly review what happened with them once we get schools reopened. I suggest that if you do not have power but have a battery operated radio, tune into WLIS 1420 AM for updates. Please also help to share the news with your friends and neighbors who may not have internet access. The Halloween Parade that was scheduled for the evening in downtown Essex will NOT be rescheduled. There will be no Essex Parade for 2012. The parade at JWJHS at 2:30 p.m. today (October 31) is open to ALL ages. If you have candy please feel free to bring it to distribute to the children. Finally, with regards to Trick or Treating this evening, please limit your canvassing in areas in town that still do not have power. There are many sections of town that do have power, we encourage you to Trick or Treat in these areas of town. Again, if anyone has any additional questions please feel free to message me or contact me on my cell phone at 860-662-0928. Have a safe and Happy Halloween! Boston—I had spoken to my dear friend Sally on the phone now and then but hadn’t seen her in quite a while. On a visit here I was stunned to see the horrors she has been going through lately. As you know, we read of new medical breakthroughs all the time. Fantastic, incredible breakthroughs. Well, it turns out there are also terrible new afflictions coming up all the time. Dreadful afflictions impossible to imagine. Sally has an awful one. I never heard of it. She told me about it, but only after I noticed how strangely she dressed she was to go outside. It was a nice day—late September at its best. I had stayed with her at her townhouse overnight. Now, breakfast over, we were going out for a little walk. The sun was behind a cloud for the moment. It was warm out and I was fine in my short sleeves. I had left my tie off and my collar was open. But Sally was going out so over-dressed. She was wearing long pants. She had a long-sleeved blouse on with the sleeves and the collar buttoned. In fact, she had three layers on. Plus a long-sleeved jacket with the collar buttoned and in fact the collar turned up. Plus a scarf wrapped around her neck. She was also wearing long gloves, and had carefully tucked them into her jacket sleeves. Finally she put on a hat. It had a big, wide brim all around. And just before she opened the door for us to step out, she pulled her jacket collar up as high as possible. Pulled the brim as far down all around as possible. And adjusted the scarf to cover as much of her cheeks as possible. As I say, this was a nice late-summer day. I was sure that nobody, nobody else in all of Boston was dressed this way. Oh, maybe a nut. Or some criminal hiding from the law maybe. I was startled by her get-up. This was not the Sally I remembered. And she noticed. “I’m sensitive to UVA ultra-violet light. Sunshine! Yes, sunshine! I’m extremely sensitive to it. It does an awful job on me. I have to shield myself against it. I dress like this to walk to my office. I dress like this to do anything and everything outside. It has really, really changed my life. “I used to love the sun. Now the sun is my enemy. I don’t dare step outside without an outfit like this. 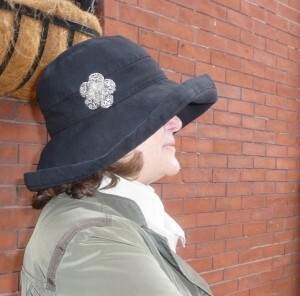 I go out as little as possible.” She took the brim of her hat and pulled it down even tighter. “And it’s such a nuisance to have to dress this way. I plan everything so I go out as little as possible. Not just to buy a newspaper. Or to take out the rubbish. Or to chat with a neighbor. I’ve stopped all that. Now, the truth. Sally is not her real name. I’ve called her Sally to protect her privacy. In fact, she insisted on that. She’s a professional lady. Sometimes people misunderstand. She’s trying to minimize her problem. Not easy when she has to take such extreme and publicly visible precautions. We had a good talk about all this. Inside again, I whistled when she showed me pictures of herself suffering from PMLE. Pictures of her bare back and upper chest. An awful rash. 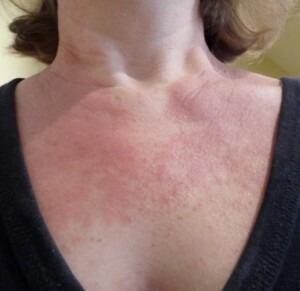 Never knew a rash could be so extreme and so devastating. Red, burning, itching skin. Very hard to live with. She pointed to her neck and shoulders in one picture. “This was at the height of one attack,” she said. “But I have avoided this level of severity for 10 months. Thank God! By going out as little as possible. And you saw how I dress when I do. It became even more fascinating when she told me background stuff. “I was severely burned when I was 21. Sunbathing! I loved going to the beach. “That seemed to be the start of this. Afterward I had odd reactions to being out in the sun. Red, blotchy outbreaks like this. I couldn’t figure it out. It was bad but I didn’t go around moaning. It got worse. It turns out you can have various degrees of it. There are light cases. Often they go away after a while. Then moderate cases. Then severe cases. One thing she’s learned is no known cause for MBLE. It seems that her terrible sunturn years ago had nothing to do with her MBLE. That seems strange. Studies are continuing. She’s found out that she must layer her clothes. Choose very dense fabrics. One layer isn’t enough. “The rays can penetrate!” In fact, she buys some items especially made to be protective against UVA. She’s even had her car windows coated. So she can’t drive with the windows open any more. She went on. “Summer is most difficult. All those clothes! It gets awfully hot. And I stand out a lot more. Some people stare. One good thing is that it’s very rare for anybody to remark about it or ask questions. I’m sure some are tempted. Again she paused. “There are worse things, I’m sure. I believe that I have a severe case. I have no doubt about it. Now I’m slowly accepting PMLE better. I mentioned up top that MBLE is a little-known affliction. Let’s hope that none of us ever get to know it better. Personally, I mean. Valley Regional High School student Laura Harkness recently had the opportunity to interview Julie Andrews about her new book that is being turned into a musical “The Great American Mousical.” She talked to her about the inspiration behind the book and what she likes about working with Goodspeed and in particular, The Norma Terris Theater. Q: When you were writing your book, was it your intention to be a musical? A: No, not at all. The reason being, at the time I couldn’t conceive how it could’ve been a musical. I think in the best of all possible worlds, maybe it could’ve been an animated film. But I never thought of it being a live musical for the theatre, even though it is a book about theatre. And we sent the book as a gift to Mr. Micheal Price at Goodspeed Musicals (Executive Director) and Mr. Alwine at Goodspeed Musicals (Associate Producer) and to our astonishment, from this gift, within 48 hours they came back and said, ‘We’d love to acquire the rights and develop it for the theater as a musical.’ And the difficulty in adapting it for the stage is the perspective issue. 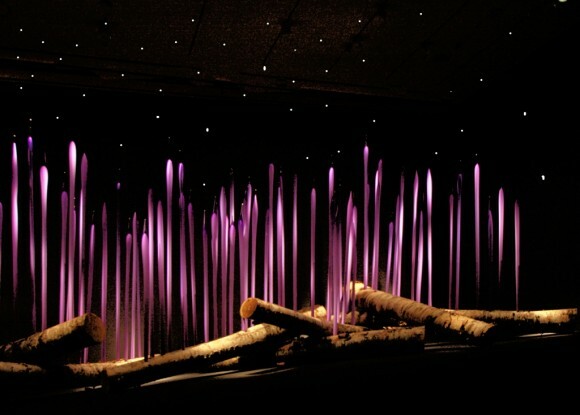 It is about a group of performing mice who have their own theater beneath the boards of a great Broadway theater. So how do you have actors playing mice and make it believable and get the audience to accept that? So, it’s one of the reasons that we never thought of it as being possible, and all of a sudden here we are just about to start rehearsals tomorrow! Q: Are you excited for that? A: Yes, very and quite thrilled with what we do have. Because we now have a new scene developed and a script for the musical by a lovely guy called Hunter Bell who has done a such honor by developing some of the characters; more than we could’ve ever have hoped. And then the music and the lyrics, the music is by Zina Goldrich and the lyrics are by a lady called Marcy Heisler and they’ve done us proud. Q: What was the inspiration for the book? A: Something quite silly! I was performing on Broadway and somebody announced that there was a live mouse in the wardrobe department. I suggested that instead of a killer trap, that they could have a heart trap (a humane trap) it in the wardrobe department and maybe they would be kind to carry the mouse out and deposit it somewhere far, far away. And they were realizing, of course, that Broadway in general is riddled with mice below the boards of any theater. But this one little mouse I just said, ‘Oh please, dear, look after him! Take it away.’ And then somebody said, jokingly, ‘He probably came up to see the stars above the stage!’ And a light bulb went off my head, and I go, ‘That would be the best idea for a middle grade novel!’ So, I began to write it with my daughter, Emma Walton Hamilton. And in the end result, here we are! It was written about 7 years ago and acquired about certainly 6 years ago. A: Yes. I’ve written, to date, about 22 with her and other 5 just coming out soon. Q: Oh really! That’s exciting! Q: Yeah, that’s so cool. So, what’s it like to write with her? A: A joy, an absolute joy. It would be as if I’m sitting across from you, and you were once this high (measures two feet off of the ground), and now I’m talking with my daughter as an absolute full grown woman with her own talent and her own thoughts of humor. We are very compatible. We finish each other’s sentences when we write like, ‘I was just going to say that!’ That kind of thing. We laugh a lot, we drink a lot of tea together, and we’ve never had an argument. We have different strengths and the best idea wins in our opinion. So if we might have a discussion about something, there’s this sort of unspoken feeling that if each other one of us is most passionate about an issue is probably right. 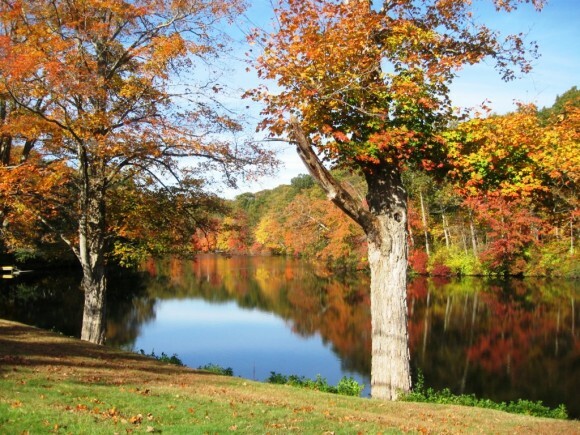 Q: Out of all of the places, you chose Chester, CT. Why did you choose this town? A: Well first of all, this is the second stage for the Goodspeed Musicals, this lovely Norma Terris Theater in Chester. Since Mrs. Price and Mr. Alwine acquired the rights here. This is also one of the rare few theaters where you can get something up on its feet and it isn’t judged. The audience knows that it’s a work in progress. So this allows us here, that rare opportunity of developing something that we hope is going to be terrific, and we feel it is. But it allows us to find out what we have in that speaks, so to speak. Q: Okay, I have one last question. Do you have any advice for aspiring singers and writers, such as myself? A: Yeah, I do. I’ve been asked that question a lot. Q: Oh yeah, I bet. A: And that is, if you’re passionate about what you do, then go for it wholeheartedly. Be prepared that if anytime, you may be surprised by a phenomenal opportunity that may come your way, and that’s when I say, do your homework. Be ready. Because you never know when something’s going to be offered to you and you say, ‘Oh my gosh!’ So in other words, be prepared to go. Q: Thank you so much! Thank you. ESSEX—A new 15-year solid waste disposal contract with the Connecticut Resources Recovery Authority, and an updated host town lease agreement for the regional solid waste transfer station, go to the voters for action at a town meeting set for Nov. 7. The town meeting will be preceded by a public hearing on the agreements that begins at 7 p.m. in town hall. First Selectman Norman Needleman said Monday the agreements that resulted from nearly a year of negotiations with the statewide trash authority would provide the town with new revenue, along with payment of rent and other incentives for hosting the regional facility that were never received by the town. “It’s a nice deal for us that will provide Essex with revenue going forward,” he said. The proposed agreements that were approved by the board of selectmen last week provide $229,721 in up-front payments to the town. A renegotiation was necessary because the long-term disposal contract with CRRA and the lease for the regional transfer station expire next month. 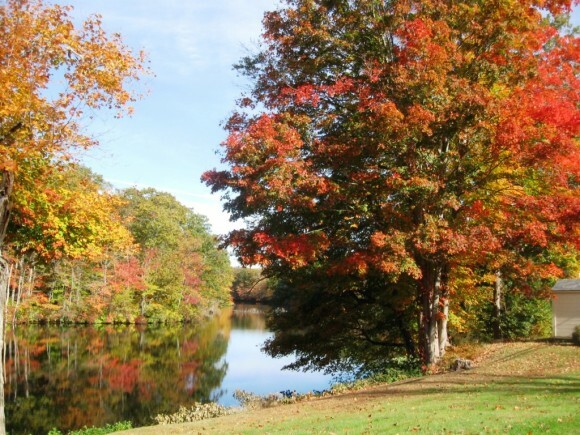 Essex, along with the other eight towns in the Connecticut River Estuary planning region, signed up as member towns for the CRRA’s Mid-Connecticut incinerator in the mid 1980s. In the late 1980s, Essex agreed to become the host town for the regional transfer station located on Dump Road off Route 154, just south of the Deep River town line. Trash from the area towns is compacted at the Essex facility and then trucked to the incinerator in Hartford. The facility also collects recyclables from the area towns. Needleman said the renegotiation was complicated by the discovery that CRRA had never provided some of the payments and benefits promised to Essex under the 1980s agreements. 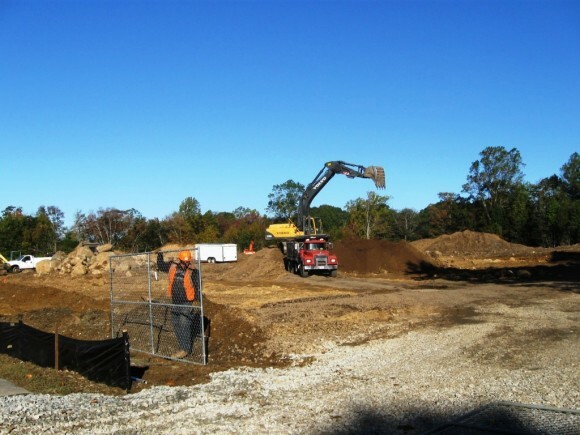 The town was supposed to receive a rental payment for the transfer station site equal to 20 percent of the annual property tax bill for the Dump Road parcel. But the site of the regional transfer station was never separated from the larger town property off Route 154, and a tax bill was never sent to CRRA. Needleman said it was also confirmed that since 2007, Essex has not been receiving the promised host town payment for solid waste and recyclables processed at the CRRA facility. The payment was to be based on the number of tons of material processed at the facility. 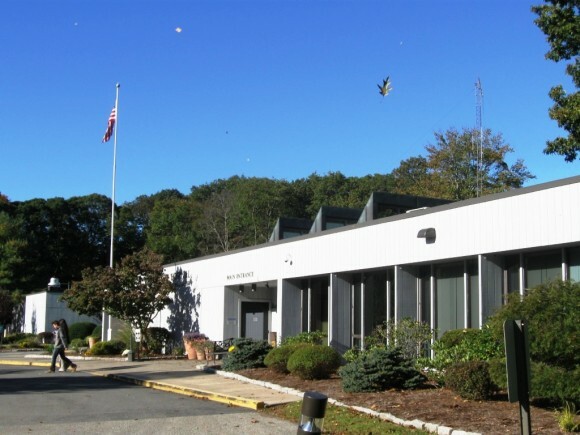 Under the agreements to be presented for approval at the Nov. 7 town meeting, the town will receive a payment of $31,765 to cover the unpaid rent for the regional transfer station site dating back to the late 1980s. There will also be a one-time payment of $197,956 to cover five years of unpaid host town payments for materials processed at the regional facility. Needleman said the town would also receive payments of $15,000 per year for lease of the regional transfer station site over the 15 year lease contract that runs through 2027. The town will also receive host town payments of 54 cents per ton for materials from other towns processed at the regional facility each year. The facility has processed between 65,000 to 70,000 tons of materials per year in recent years, a figure that would represent about $37,000 per year in revenue for the town. The amount could decrease if fewer tons are processed at the facility. Under the 15-year municipal service contract, Essex will be required to pay CRRA a per ton tipping fee for trash and recyclables generated in Essex that are processed at the regional facility. The tipping fee, set initially under the agreement at $59.50 per ton, is less than the $70 per ton fee Essex and other towns are now paying for use of the facility. Needleman said the municipal service agreement with CRRA, along with the updated site lease and host town agreement, would be presented to voters for action as a single resolution at the Nov. 7 town meeting. Most of the towns currently using the CRRA transfer station, including Chester and Deep River, have already approved the new 15-year contract with town meeting votes. The Connecticut Valley Camera Club (CVCC) will be hosting a photography exhibit at the Fresh Ayre Gallery (formerly Lemon ‘n Lyme) in the Old Lyme shopping center. The subject is “open” with 43 framed prints for viewing and for sale at very reasonable prices. The public is invited to attend the opening reception from 5:00pm to 7:00pm on Friday, Nov.2, 2012. The exhibit is open to the public from 12-5pm Tues-Sun and late on Friday’s from November 3rd through November 29th, 2012. The CVCC meets the last Monday of each month at 7:00 pm at the Community Room (lower level) of the Deep River, CT Library (photographers at all levels are welcome). Sir Winston Churchill is a towering figure in 20th century history, a prodigious writer, and one of its most-quoted speakers and thinkers. Why do his speeches and quotes continue to resonate, years after those of his contemporaries are largely forgotten? Join Richard M. Langworth, editor of Finest Hour and of the new book of Churchill’s wit and wisdom, Churchill By Himself: The Definitive Collection of Quotations , for a talk on “What Really Matters Most About Winston Churchill?”, Thursday November 1 at 6:30 PM, at Essex Meadows’ Hamilton Hall Auditorium. Copies of the book will be available for sale and signing. 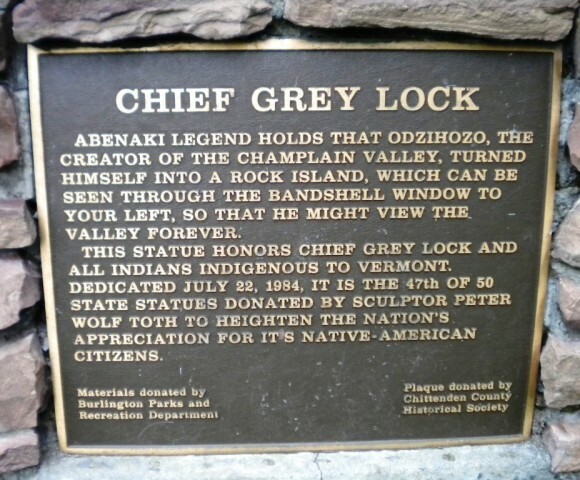 Sponsored by the Connecticut Churchill Society, a donation of $10 per person is requested. Refreshments will be served before and after the lecture, and advance registration is requested and may be made by calling the Essex Library at 860-767-1560. Essex Meadows is at 30 Bokum Road in Essex. ESSEX – Middlesex United Way’s annual Days of Caring are being held the first two weeks of October, and a team of employees from Tower Laboratories LTD volunteered on Oct. 3 at Essex Elementary School in Centerbrook. Middlesex United Way Day of Caring is an annual event that matches groups of volunteers from local companies with meaningful volunteer projects that advance the common good. Middlesex United Way’s focus areas are education, income, health, and housing; this year, Day of Caring projects support education by connecting companies to local schools. Tower Laboratories employees worked with a group of fifth and sixth graders from the Green Team after-school club to plant flowers at the school. Over several days, teams are volunteering at nine schools in six Middlesex County towns. Volunteers are doing storytelling, reading, and activities with children in the classroom; speaking about their careers; and improving the learning environment for children through gardening, mural, and other beautification projects. Teams of volunteers from local companies donate their time to these volunteer projects. Participating companies include ATD Wireless Zone, Brown & Brown of CT, Carlson & Dumeer LLC, Citizen’s Bank, Clean Choice Commercial Cleaning LLC, GKN Aerospace Services Structures Corp, Liberty Bank, Middlesex Hospital, Rolls Royce Naval Marine, Inc, Russell Library, TD Bank, Tower Laboratories LTD, and Wesleyan University. Middlesex United Way is a locally based organization dedicated to strengthening lives, helping people, and improving community conditions in the fifteen towns in Middlesex County. To learn more, visit www.middlesexunitedway.org or facebook.com/middlesexunitedway. CHESTER— The Chester Planning and Zoning Commission has rejected a petition to change the zoning from residential to commercial for a single parcel at 90 Goose Hill Road, off the west side of Middlesex Avenue (Route 154). The panel rejected the petition from local resident Gary Clark on a unanimous vote at its Oct. 4 meeting. The proposed zone change had been presented at a Sept. 6 public hearing that was continued to Oct. 4. The proposed zone change had drawn opposition from two nearby property owners at the public hearings. Clark had requested the zone change for a four-acre parcel at 90 Goose Hill Road. Clark proposed to locate his landscaping business on the parcel, storing equipment in a barn and trailers. The property would receive access from a right-of-way off Middlesex Avenue. In rejecting the proposed zone change, the commission determined the change was “inconsistent with the plan of conservation and development,” and would require access through the residential zone. The panel also determined the parcel at 90 Goose Hill Road “was not suitable for commercial development.” Commission members had walked the property during a site inspection in September. 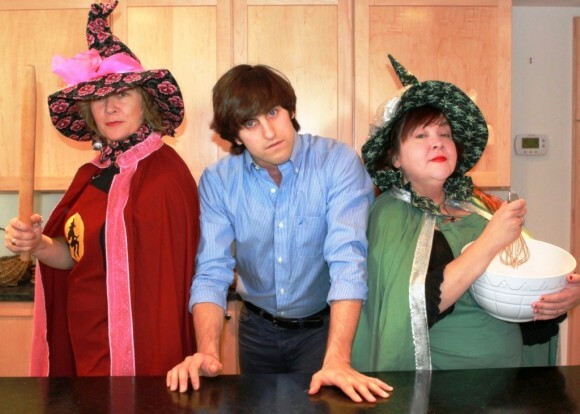 Old Lyme Professional Organizer, Dixie Allen, of Amazing Space, will appear in an upcoming episode of A&E’s popular and Prime Time Emmy Nominated series, HOARDERS. Allen worked behind the scenes in the upcoming episode with the professional team of Dr. Darnita Payden as they documented the struggle of a Long Island women attempting to overcome her battle with hoarding. According to the Mayo Clinic, hoarding is defined as “The excessive collection of items, along with the inability to discard them.” Hoarding often creates such cramped living conditions that homes may be filled to capacity, with only narrow pathways winding through stacks of clutter. Some people also collect animals, keeping dozens or hundreds of pets often in unsanitary conditions. People who hoard often don’t see it as problem, making treatment challenging. But intensive treatment can help people who hoard understand their compulsions and live safer, more enjoyable lives. Allen was invited to help assist in a crisis de-cluttering of the Long Island resident’s home. Along with local medical help, Allen lends her expertise as she works with the HOARDERS aftercare team to help the client learn new organizing skills and habits. Research cited by Dr. Catherine Ayers at UC San Diego (ocfoundation.org/hoarding) indicates that older adults in particular may actually respond better to being taught specific, concrete , organizing skills. Professional Organizer Dixie Allen, owner and operator of Amazing Space, has been in business since 1995 when she started her organizing firm in Washington D.C. She is in the Golden Circle of the National Association of Professional Organizers and a Docent at the Florence Griswold Museum. 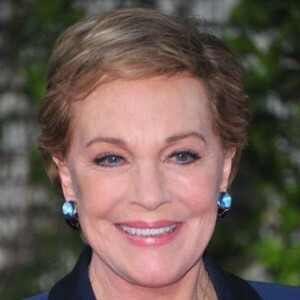 She will Chair the Garden Tour 2013 for Child and Family Agency of Lyme, Old Lyme. As a Professional Organizer, Allen works with all ages and specializes in downsizing for seniors who are making “lifestyle transitions” to retirement living, staging homes with realtors, and creating order, simplicity and efficiency in all areas of the home and home office. The episode of HOARDERS will air this season on Mondays at 9 pm on A&E. For more information on the series, please go to www.aetv.com/HOARDERS. To contact Amazing Space, call 860-861-8500 or E mail: deedadix@me.com. Two time Tony Award-winning Goodspeed Musicals, under the leadership of Executive Director Michael P. Price, is delighted to announce its Golden Anniversary season at the Goodspeed Opera House in East Haddam, Conn. The 50th season includes three very special musicals that are sure to please theatergoers: the charming collegiate comedy Good News will run from April 12 – June 22; Jerry Herman’s beloved Hello, Dolly! will run from June 28 – September 8; and Frank Loesser’s enchanting Broadway hit The Most Happy Fella will run from September 20 – December 1, 2013. “To the cheers of many, on June 18, 1963 the footlights were once again lit on the Goodspeed Opera House stage. And now, fifty years later, we are in awe that so much has happened in and because of this gem of a building. It truly was an impossible dream that, from this tiny stage, the world of American musical theatre would be changed forever. Our Golden Anniversary celebration will feature three extraordinary musicals which we believe uniquely highlight what Goodspeed does best,” said Mr. Price. Good News, a 1920s tale of collegiate hijinks will be revitalized in the Goodspeed tradition of bringing new life to long-forgotten American musicals. It is followed by Hello, Dolly! which is one of the most popular American musical classics of all time. This marvelous musical makes its debut on the Goodspeed stage in honor of the 50th Anniversary of its out-of-town tryout! Our 2013 finale The Most Happy Fella, a powerful and romantic musical, will mark the triumphant return of one of Goodspeed’s most successful productions – – at the Opera House and on Broadway. Good News has Words and Music by B.G. DeSylva, Lew Brown and Ray Henderson, and Book by Laurence Schwab, B.G. DeSylva and Frank Mandel. Good News will be directed and choreographed by Vince Pesce who choreographed Goodspeed’s Mame and directed and choreographed Something’s Afoot. Mr Pesce served as Associate Choreographer of Broadway’s Anything Goes, The Pajama Game, Wonderful Town, and Little Shop of Horrors. Hello, Dolly! features Music and Lyrics by Jerry Herman and a book by Michael Stewart based on the play “The Matchmaker” by Thornton Wilder. Hello, Dolly! will be directed by Marc Bruni who served as Associate Director for Broadway’s Nice Work If You Can Get It, Anything Goes, Irving Berlin’s White Christmas, Legally Blonde, and High Fidelity. Mr. Bruni makes his long-awaited return to Goodspeed Musicals where he previsouly served as Associate Director for They All Laughed in 2001. The Most Happy Fella features Music, Lyrics and Book by Frank Loesser and is based on Sidney Howard’s “They Knew What They Wanted.” It will be directed by Rob Ruggiero who is well known to Goodspeed audiences for such hits as Carousel, Show Boat, Camelot, and 1776. Advance season subscriptions are now on sale through the Box Office (860.873.8668), open seven days a week. Subscription prices range from $81 – $219 at the Goodspeed Opera House for one person, all three shows. Single tickets go on public sale beginning February 17, 2013. Dedicated to the preservation and advancement of musical theatre, Goodspeed Musicals produces three musicals each season at the Goodspeed Opera House in East Haddam, Conn., and additional productions at The Norma Terris Theatre in Chester, Conn., which was opened in 1984 for the development of new musicals. The first regional theatre to receive two Tony Awards (for outstanding achievement), Goodspeed also maintains The Scherer Library of Musical Theatre and The Max Showalter Center for Education in Musical Theatre. 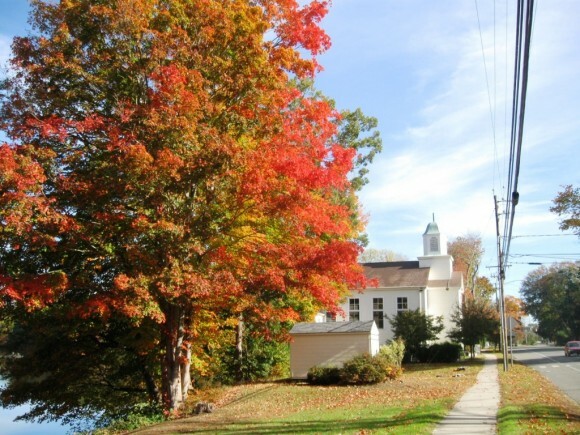 Goodspeed is supported in part by the Department of Economic and Community Development with support from the Connecticut Office of the Arts. For 20 years, Rotary clubs have remained determined to do whatever is necessary to achieve a world free of the crippling disease polio. Recognizing this commitment – as well as Rotary’s important role as a spearheading partner in the Global Polio Eradication Initiative, the United Nations and the World Health Assembly have partnered with Rotary to completely eradicate polio by the end of 2012. Rotary’s chief responsibilities in the initiative are fundraising and advocacy, a role of increasing importance as the end game draws near. Sixty-one Rotary clubs in Fairfield, Litchfield, Middlesex and New London counties have embraced this effort by using Thunderclap, a Social Media tool which enables supporters to sign up to share a single message simultaneously across all supporting accounts on World Polio Day, October 24, 2012 to raise awareness of the fight to end this crippling disease. In addition, these clubs have provided an army of volunteers to promote and assist at national immunization days in polio-endemic countries around the world. Connecticut State Governor, Dannel Malloy will be issuing a proclamation on October 24, 2012, in support of End Polio Day. “When Rotary first started the fight against polio in 1985, the disease affected 350,000 people every year in 125 countries. Since then, polio has been reduced by 99%. We are “This Close” to ending polio,” says Brian Amey, Governor, Rotary District 7980. Rotary, which already has contributed $1.2 billion to stop this crippling childhood disease, announced its new funding commitment in New York City on Sept. 27 during a special side-event on polio eradication convened by United Nations Secretary-General Ban Ki-moon during the 67th Session of the UN General Assembly. Earlier this year, Rotary raised $228 million in new money for polio eradication in response to a $355 million challenge grant from the Gates Foundation, which promptly contributed an additional $50 million in recognition of Rotary’s commitment. Polio cases have plummeted by more than 99 percent since 1988, when the disease infected about 350,000 children a year. Fewer than 700 new cases were reported in 2011. Rotary and its partners have reached more than 2.5 billion children with the oral polio vaccine, preventing more than five million cases of paralysis and hundreds of thousands of pediatric deaths. To learn how you can participate in this historic opportunity to end polio once and for all, please visit rotary.org/endpolio. The 61 clubs in twelve areas of District 7980 are part of a much larger organization-Rotary International (www.rotary.org). Rotary International is made up of 34,000 clubs in 200 countries and geographical areas with over 1.2 million members. The organization works to help the world’s needy people and to further world peace and understanding as evidenced by its unique role as a founding member of the United Nations, retaining a permanent seat on the General Council. The Rotary International Foundation invests each year in humanitarian and educational projects throughout the world. The area clubs support many of these programs such as the Polio Eradication program, the Haitian Health Foundation and Clean Water Projects in South India and Ghana. 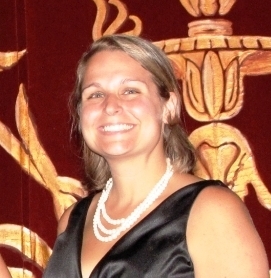 REGION 4— Valley Regional High School Principal Kristina Martineau has been named as an outstanding first year principal by the Connecticut Association of Schools. Martineau, a Guilford resident, completed her first full year as principal at Valley Regional High School in June after serving as acting principal for much of the 2010-2011 school year. 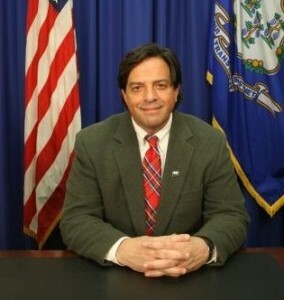 A former English teacher and dean of students for the Fairfield school system, Martineau was hired in Regional School District 4 in 2008 as the associate principal at the high school. She is one of two first year principals to receive the statewide award from the Connecticut Association of Schools. 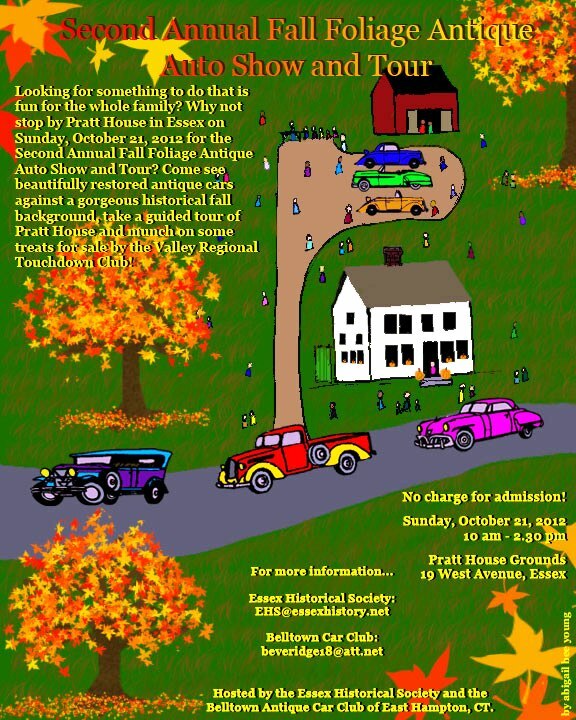 The Essex Historical Society and the Belltown Antique Car Club of East Hampton, CT are hosting the Second Annual Fall Foliage Antique Auto Show and Tour at the Pratt House in Essex on Sunday, October 21st from 10am – 2:30 pm. Come see beautifully restored antique cars and take a tour of the Pratt House. There is no charge for the event. 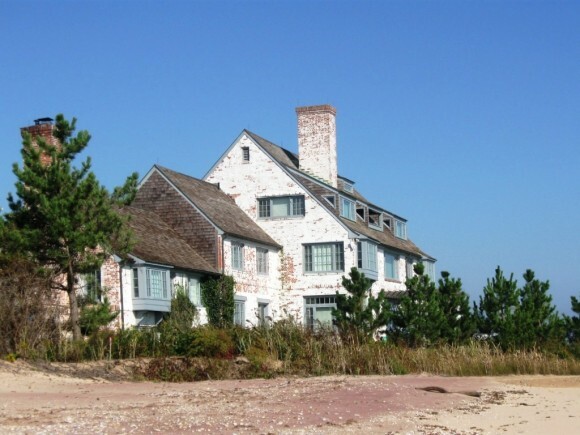 Pratt House is located at 19 West Avenue in Essex, CT.
What mysteries lurk in the old graveyard? What messages are hidden in its ancient tombstones? What stories could its denizens tell, if they could talk? Get a view of our old town’s history through the stories of its early residents, as revealed by their final resting places. It’s spooky good fun for adults, and a not-too-spooky good time at the Library for the little ones. This program is free and open to all, but registration is requested. Please call the Essex Library at 860-767-1560. The Library is at 33 West Avenue. The Essex Library is an equal opportunity provider and employer. REGION 4— The Region 4 school boards have formed a study committee to review options for the district’s sixth grades, including the possibility of moving sixth grade from the three elementary schools to the John Winthrop Middle School in Deep River. Superintendent of Schools Ruth Levy said Thursday the study committee would hold it’s first meeting this week, with a goal of presenting a report to the district school boards by April 2013. The study committee, with about 18 members, is comprised of board members, administrators, teachers, and parents. Levy said anticipated declines in student enrollment could free up classroom and program space at the middle school for the sixth graders now attending the elementary schools in Chester, Deep River, and Essex. John Winthrop Middle School, which underwent a renovation and expansion completed in 2005, currently serves seventh and eighth grades. But middle school programs in many Connecticut school districts now include sixth grade. Levy stressed the study is not intended to set the stage for a building project proposal for the middle school. She noted the study would help determine whether there is space at the middle school to accommodate the sixth grades. Any move of the sixth grades to the middle school would require approval from all four of the Region 4 school boards, along with approval from voters of the three district towns at a district meeting or referendum. 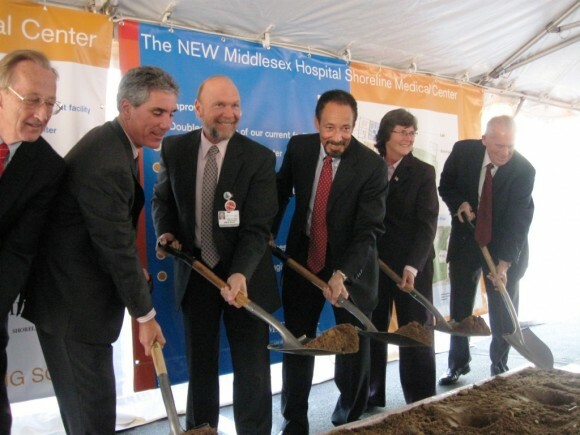 “Shovelers,” left to right, Noel Bishop, First Selectman of Westbrook; Vincent G. Capece, President & CEO, Middlesex Hospital; Harry Evert, Senior Vice President, Middlesex Hospital; Christopher Seaton, Chairmain of the Board of Directors, Middlesex Health Systems; Darlene Briggs, Chairwoman, Westbrook Division, Middlesex Chamber of Commerce; and Larry McHugh, President Middlesex Chamber of Commerce. Westbrook First Selectman Noel Bishop was all smiles at the October 10 official groundbreaking ceremonies of the new Middlesex Hospital Shoreline Medical Center, scheduled to open in Westbrook in 2014. Bishop should be pleased, because for the past 37 years Middlesex Hospital has been operating its Shoreline Medical Center in neighboring Essex, and now the clinic is moving to Westbrook. When the Medical Center moves from Essex to Westbrook, it is uncertain as to what the Hospital will do with the Essex facility. A number of possibilities are being assessed. Worth noting is the fact that both Westbrook First Selectman Noel Bishop and Old Saybrook First Selectman Carl Fortuna were on hand for the ceremonies. However, Essex First Selectman Norman Needleman was unable to attend the celebration. There was Included in the tent of notables, which had been set up off the Tanger Outlets, were the President and CEO of Middlesex Hospital, the Chairman of its Board of Directors, local Chamber of Commerce executives, among other dignitaries. Also, attending were over a hundred well wishers standing under a breezy tent that protected those present on a blowy and sunny afternoon. At the groundbreaking a number of speakers noted that that it was over 40 years ago that Middlesex Hospital made its decision to expand its emergency medical services out into the shoreline communities. In fact, the first “out placing” of emergency medical services by Middlesex Hospital took place in a single small building located along Main Street in Centerbrook. This facility was a great success, and it demonstrated that there truly was a need for an outreach of emergency medical services along the shoreline. Then, in 1975 the hospital moved its Shoreline Medical Center from Centerbrook to a piece of privately donated land on Westbrook Road in Essex. Providing emergency medical services will continue to be offered at this Essex location up until the new Medical Center opens. Then, after that all emergency medical services will be provided at the new facility in Westbrook. The exact of address of the new facility will be will be 250 Flat Rock Place in Westbrook. Also, cited by the parade of speakers was the fact that the new Shoreline Medical Center in Westbrook would be 44,000 square feet in size, which is twice the size of the present facility in Essex. Others noted that there will be plenty of parking at the new emergency facility, as well as, perhaps the most obvious advantage of all; the clinic’s location will be very close to Exit 65 on I-95, a heavily traveled Interstate. It also appears to be a very profitable approach, one where you can not only double the size of your present facility, but leave enough room on the land to treble the size, if necessary. 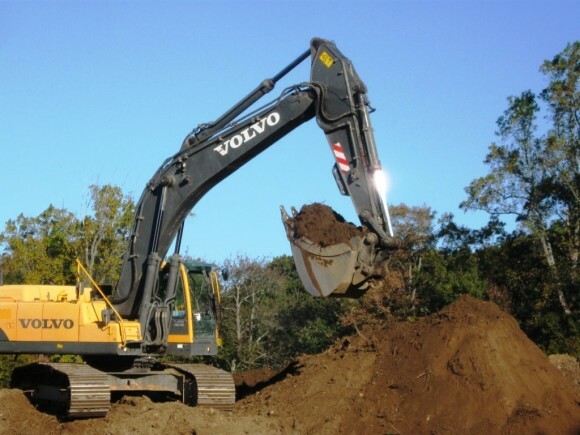 During the remarks in the tent on the grounds of the Tanger Outlets, just down the road on the right hand side, going towards I-95, there was a huge amount of earth moving going on. Across an expanse of land that was until a week or so ago a heavily forested area, the ground was now being leveled to make way for the new emergency clinic. Large boulders, which were just a few days ago were underground, were now stacked up in one gigantic mound. Everything was being done to level a shelf of land for the building that will house Middlesex Hospital’s new Shoreline Medical Center. Factually speaking, it was here at the construction site, where the first, true groundbreaking took place, perhaps a week or so ago. Furthermore, the dress of those who participated in this first “groundbreaking” wore work clothes and not business suits, although perhaps a suit or two came by for a brief look. Still, the vision, and the willingness to take large risks to adopt a new and growing approach to providing medical care, belonged to those who wore the suits and spoke at the ceremonies under the tent up the road from the construction site. As for the nine primary features of this new facility, they were listed on one of the tent walls as follows: 1) Improved location; 2) Double the size of our current facility; 3) Expanded emergency center; 4) Improve patient privacy: 5) Separate entrance to outpatient center; 6) Lab services; 7) Infusion therapy; 8) Expanded radiology services; and 9) Designated Women’s imaging area. Of this list perhaps the first, “Improved location,” is the most important. The new Westbrook location, although certainly not as desirable for Essex residents, for other shoreline residents, the new location on I-95 will be far more convenient and accessible. Residents of Old Lyme and Lyme, and even Niantic , now have simply to get on I-95 for quick access to the facility. Old Saybrook, Westbrook and Clinton residents will also have easier access to a facility on I-95. Also, residents in the towns along Route 9, which merges seamlessly into I-95, will also have greater ease of access. In a way the new location is a “win, win” for almost everyone. The hospital can address increased patient volumes and patients get more accessible medical care in an expanded and more modern facility. DEEP RIVER— Voters at a town meeting Tuesday approved a total of $123,228 in additional appropriations under four categories in the 2011-2012 town budget, including a $44,549 appropriation for Deep River Elementary School that generated the most discussion at the town meeting. Town officials outnumbered residents at the town meeting, where the three selectmen were joined by Town Clerk Amy Winchell, and residents Margo Hilfinger and Richard Strukus, who attend most town meetings as the video crew for the Deep River Taxpayers Association. Volunteers from the taxpayers association have been filming town meetings and meetings of the board of selectmen for more than a decade for later showing on the Comcast public access channel. The additional appropriations includes $42,569 for town hall operations, specifically fuel oil and gasoline and diesel for town vehicles, $22,707 for special services for contingency expenses and a lease payment on a copier, $13,403 for police protection, specifically overtime for the resident state trooper and vehicle maintenance, and $44,549 for the elementary school. It was the appropriation for the elementary school that generated more than a half-hour of discussion at the meeting. First Selectman Richard Smith said he was advised by the school board and administration that over-expenditures for special education led the school district to miss a payment for employee pensions, which are managed by the town. Smith said when the school district made the pension payment, it generated most of the $44,549 over-expenditure. 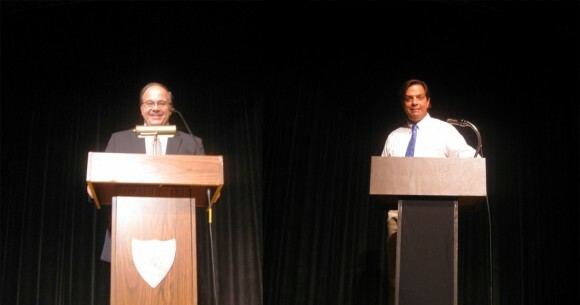 Hilfinger and Strukus each questioned the overexpenditure, contending the local board of education should have advised the selectmen and board of finance of the overrun in special education costs sooner, and made budget reductions over the fiscal year that ended June 30 to cover the required pension payment. Smith said school officials have pledged to provide monthly updates of spending from the education budget to reduce the chances of a large budget overrun in the future. 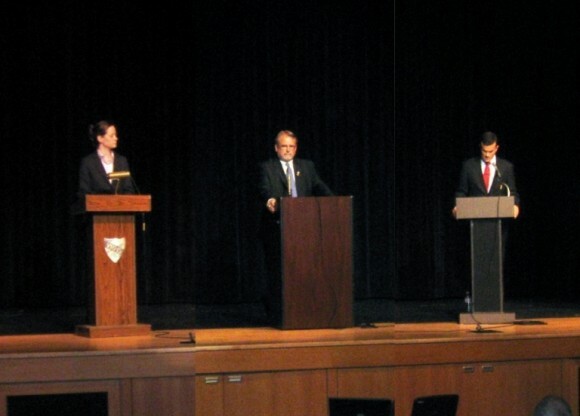 The four additional appropriations were approved on a voice vote, with Strukus opposed. Smith said budget savings and new revenue, including higher rental payments for a cellular phone tower on town property, are expected to cover all of the additional appropriations for the 2011-2012 budget without the need for a transfer from the town’s undesignated fund balance. 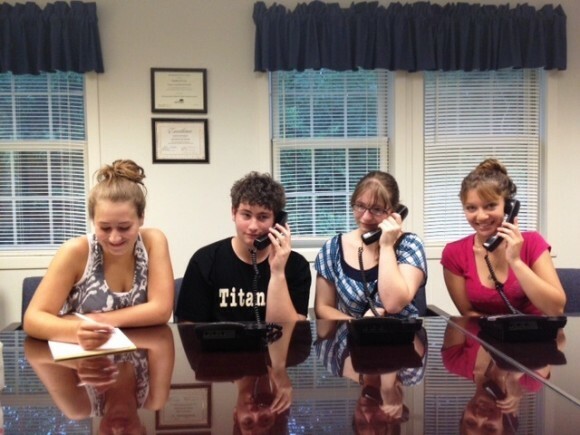 Tri-Town Youth Services’ volunteer callers will be making calls to fellow residents of Chester, Deep River, and Essex during the evenings of November 13, 14, and 15 to seek your support for Telethon 2012. A nonprofit agency, Tri-Town receives some state and municipal fundings, several miscellaneous grants, holds fundraising events (such as Taste of the Valley), collects program fees, and is dependent on donations to meet its annual operating budget. Donations in response to their thirteenth annual Telethon will be deeply appreciated and used to help the agency continue to provide a wide array of services to local youth and families. Further information, contact Tri-Town at 860-526-3600. This story involves a dispute between the Borough of Fenwick Historic Distrcit Commission and a very large, New York City developer, Frank J. Sciame, Jr. In the end the Historic Commission won the case, and developer Sciame lost. In the Fenwick Historic Commission’s review of Sciame’s massive reconstruction of Katherine Hepburn’s former estate, the Historic Commission had one quibble. That was that the two, new granite posts at the entrance to the estate, were simply too high. Therefore, the Historic Commission ordered the developer to lower the height of both of the two posts from their height of 60 inches to a lower height of 48 inches. Sciame duly responded to the Commission’s request — but not exactly in the way that the Commission intended. Rather than simply slicing 12 inches off the tops of both posts, Sciame built around the base of the posts, two flower beds, each of which were 12 inches high. 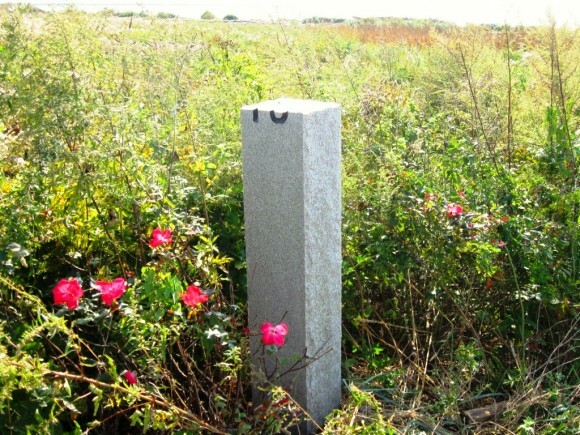 Sciame then advised the Historic Commission that he had complied with its order, because if you measured the posts from the top of the flower beds to the top of the posts, the height of both posts was 48 inches. Furthermore, Sciame told the Historic Commission, if it did not like this way of doing things, it should take him to court. The Fenwick Historic Commission did just that, and the result was a ruling by State Superior Court Judge Robert L. Holzberg that was a “win, win” for the Fenwick Historic Commission. The Judge in his opinion held, “[T]he most reasonable interpretation of the [Fenwick Historic Commission’s] order [to lower the height of the posts] is that the pillars must be reduced in height such that from the roadbed or whatever location that they are anchored into the ground, the height of the top of the pillar is forty eight inches.” In short, Sciame’s attempt to measure the height of the posts from the top of the flower beds was rejected by the court. The Court also ordered compliance with its order, “within 45 days of this judgment.” Since the court’s decision was rendered on August 2, “within 45 days” would mean that the posts should have been shortened by September 16. Although the developer may have missed the court’s deadline by several days, an inspection on October 6 revealed that both of the posts at the entrance to the estate have been neatly sliced off from the top, and the height of both posts are now 48 inches, from the ground up. 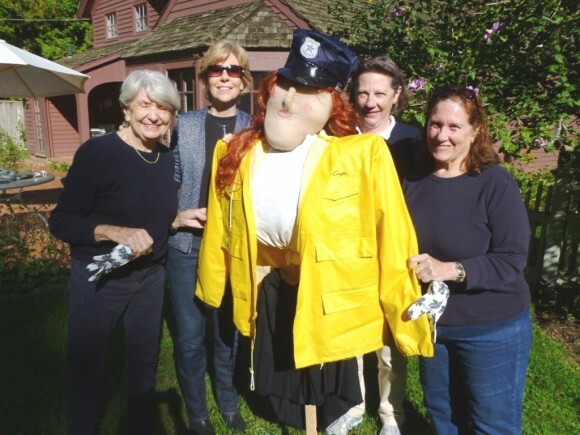 In true Halloween tradition, Essex Garden Club members, Eve Potts, Suzanne Tweed, Barbara Burgess and Genie Devine created “Gertie”, the Essex Garden Club’s entry to the annual Essex Scarecrow Festival occurring on Oct. 6, 2012. They installed our new Silent Policewoman on Oct. 4, 2012. 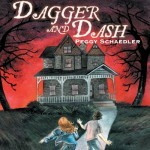 Essex library is very excited to host an author event and book signing with Peggy Schaedler, children’s author and school media specialist extraordinaire! Schaedler, of the Deep River Elementary School will be at the library to present her new novel Dagger and Dash: The Scrimshaw Medallion. She’ll talk about what it’s like to be a writer and will take questions from students about her new characters Amanda Dagger and Freddy Dash. Please call the Essex Library for more information or to register for this event at 860-767-1560. CHESTER— The board of selectmen Tuesday got its first look at a plan for a $3.09 million renovation and expansion of the Chester Public Library that was developed by a library expansion feasibility study committee established earlier this year. The board made no immediate decision on how, or when, to bring the project to the town’s voters in a possible bonding referendum. 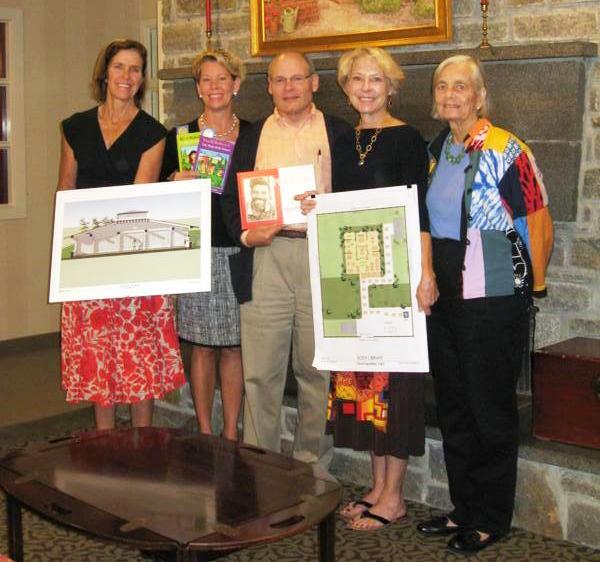 Library Director Linda Fox, and Terry Schreiber, chairwoman of the study committee, were joined for the presentation by architect Kenneth Best, with the South Windsor firm of Drummney-Rosane-Anderson Inc. The firm was hired last spring, using funds from a $20,000 state grant, to investigate options for a renovation and expansion of the historic 1906 library building located on West Main Street, also known as Route 148. Best presented a preliminary conceptual plans for a 2,000 square-foot expansion that would double the size of the existing 2,000 square-foot library building. There would be additions on both the east and west sides of the building, providing an expanded children’s section, a larger program space, an office for the library director, and additional storage space. The building would be made completely handicapped-accessible, with a new staircase and elevator from the basement-like lower level. The historic front entrance with steps would be preserved, with a new, handicapped-accessible main entrance from the west side of the building. There would also be a new and relocated septic system, new restrooms, and a new heating, ventilation and air conditioning system. The total cost of the project is estimated at $3,091,600, including funding for a temporary location for most library programs and services during the estimated 12 to 15 months of construction. Best said building a new library in a different location would cost at least $2.75 million, a figure that does not include any and acquisition expense. Schreiber said the elected library board of directors would like to proceed with the project, noting the idea of a renovation and expansion has been studied for nearly three years. “We’d like to go with it,” she said. Fox said library supporters were hoping for a bonding referendum next spring or summer, with Best noting the cost estimates were based on 2014 construction dollars. The selectmen were supportive, but cautious, with First Selectman Edmund Meehan noting there are no funds set aside in the current town budget to pay for a more detailed design plan that could be presented to the voters in a bonding referendum. Selectman Tom Englert and Selectman Lawrence Sypher each suggested that library supporters should conduct a fundraising drive that could help reduce the total bonding expense for taxpayers. “It’s a big number for people to swallow in these economic times,” Englert said. Best said an appropriation of about $15,000 would pay for more detailed schematic designs plans and cost estimate that could form the basis for a bonding proposal. He said it would cost about $150,000 to produce extremely detailed “bid ready” design plans for a building project. Meehan said he would prefer to use a less costly design effort to set the stage for a bonding proposal, while adding that selectmen, working with the board of finance, would not be able to identity funding for further design work until early next year. Meehan said some surplus funds could be generated by the rental payments from Essex Savings Bank for the leased space at town hall, along with the possibility of some unexpended education funds after school spending audits are complete later this fall. Meehan urged the library expansion committee to “flesh out some options on how to proceed,”’ with the board to discuss the library project further at a future meeting. Chester student Eric Pease, 5th Co. 3/C Cadet has been named Cadet of the Year at the Massachusetts Maritime Academy. Cadet Pease received the honor for outstanding academic, leadership abilities, and community service participation during the year. Massachusetts Maritime Academy is a four-year state college offering undergraduate degrees in Emergency Management, Facilities Engineering, International Maritime Business, Marine Engineering, Marine Safety & Environmental Protection and Marine Transportation. Graduate degrees are offered in Emergency Management and Facilities Management. The Academy, located on Cape Cod, is the oldest continuing Maritime College in the country. The upcoming concert of The Small Town Concert Series is called Everybody Knows Leonard Cohen, but just in case you don’t, there is a chance to get acquainted with the songs of the legendary artist at Congregation Beth Shalom Rodfe Zedek (CBSRZ) in Chester on October 21 at 5 pm. Cohen is known not simply as a musician, but also as a poet whose words etch his songs in the listener’s memory. 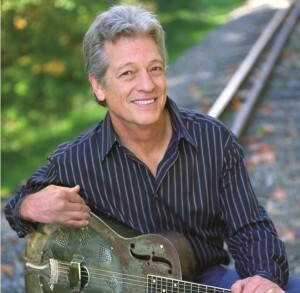 It’s the sixth annual tribute by The Small Town Concert Series, this year also sponsored by CBSRZ. The concert headlines Chester resident Lauren Agnelli, nominated for a Grammy with the 1980s folk rock group The Washington Squares; features familiar Chester faces – elementary school music teacher Meg Gister on keyboard and vocals; Dana Takaki on violin and her daughter Rachael Aikens, a Valley Regional High School senior, as a vocalist; and Hillyn Natter of Deep River on drums. 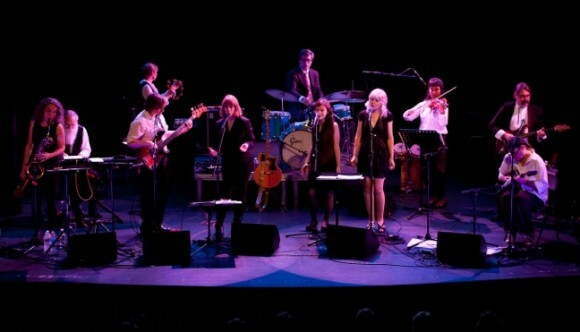 The Small Town Concert Series band, Amalgamated Muck, will backup the performers. Tickets ($20) in advance are available at CBSRZ (860-526-8920) or may be purchased at the door. CHESTER— The planning and zoning commission will resume the public hearing Thursday on a proposed residential to commercial zone change for a four-acre parcel at 90 Goose Hill Road. The public hearing that began on Sept. 6 will reconvene at 7 p.m. at the Chester Meeting House on Liberty Street. The panel had continued the public hearing on the petition of local resident Gary Clark to change the zoning for the parcel at 90 Goose Hill Road from residential to commercial. Clark had told the commission he wants to move his landscaping business to the parcel, which receives access from a right-of-way of the west side of Middlesex Avenue, also known as Route 154. Clark wants to store equipment related to his business in a barn and trailers on the parcel. Clark told the commission he plans to construct a house on an abutting parcel at 233 Middlesex Avenue. The proposed zone change drew opposition from Glen Reyer, who has received zoning approval for a four-lot residential subdivision on a nearby 14-acre parcel. Reyer, a co-founder of the Chester Common Ground Party, was an unsuccessful candidate for board of selectmen in last year’s town election. Reyer contended the zone change to commercial would establish a bad precedent for other parcels on and near Route 154, leading to spot zoning and “zoning creep” in the future. Also objecting to the proposed zone change was Betty Perreault, who owns a nearby property at 50 Goose Hill Road. 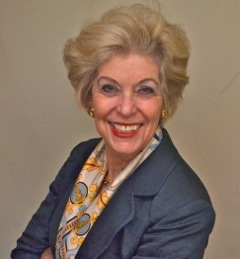 Perreault served as first selectwoman from 1989 to 1993. 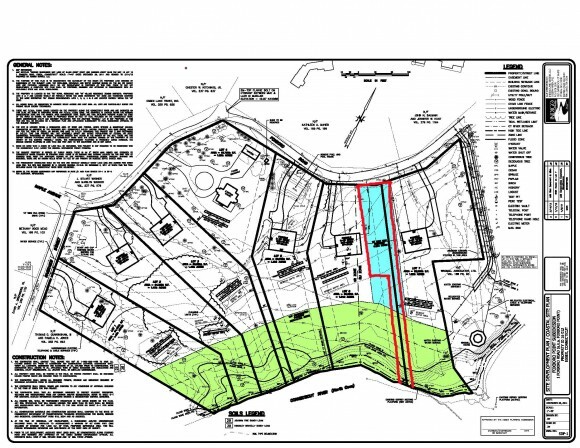 Five Foxboro neighbors have joined the cause of developer Frank J. Sciame, Jr. by filing their own Complaint and Appeal in Superior Court against the Essex Planning Commission’s approval of a “public access” corridor across Sciame’s development on Foxboro Road. Sciame’s development is located on eleven plus acres that run along Foxboro Road and River Street overlooking the North Cove in Essex. The protesting neighbors in this court action are Thomas D. Cunningham, III, Pamela H. Jones, Kathleen A. Maher, John N. Bauman and Jennifer W. Hunt. Their suit states that they all “are owners of real property which is located within 100 feet” of Sciame’s development. The Foxboro property owners say in their suit that they are “aggrieved by the decision of the Essex Commission” to require a “public access” corridor to run across Sciame’s development. Their Complaint and Appeals track closely an earlier legal protest by Sciame, himself, in Superior Court. Sciame filed his lawsuit on September 19, and the neighbors filed theirs two days later. Both lawsuits are still pending before the court. 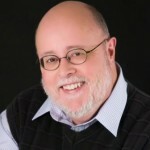 The legal papers of the neighbors’ lawsuit were prepared by Attorney John S. Bennet, Esq. The “public access” corridor approved by the Essex Planning Commission, and challenged by both appeals would run from Foxboro Road down to the waters of the North Cove. At Foxboro Road, the width of the corridor would be 150 feet. Then about half way down, the corridor would narrows to 75 feet until it reaches North Cove. 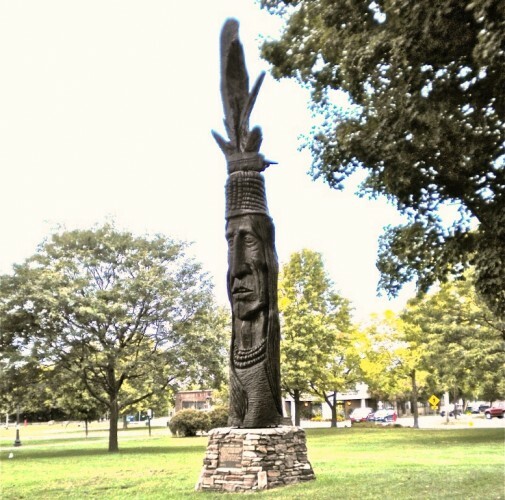 In its approval of the “public access” corridor across Sciame’s development, the Essex Planning Commission placed strict limits on the site’s use by the general public. 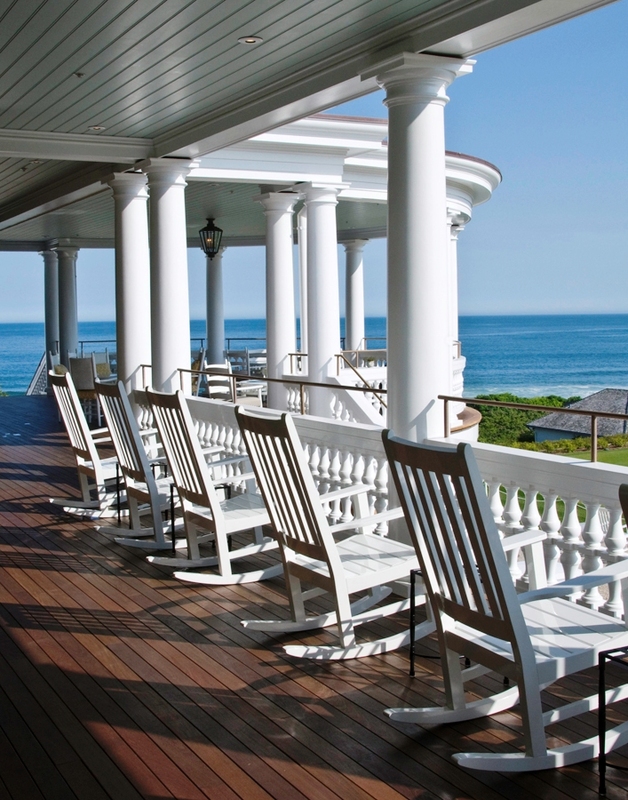 Specifically, the Commission required that there could be no “buildings, structures or other improvements on the property other than a bench or benches to allow visitors to view North Cove.” In addition, the Commission decreed that the use of the corridor could be limited to daylight hours. 1. It has purported to require public access over private land, all beyond statutory authority of the Commission. 2. It has purported to take for public use an extremely valuable portion of the private Property which taking is beyond statutory authority. 5. It is creating a sixty thousand square foot lot (in a town) zone which is nonconforming in several ways, contrary to the Essex Zoning regulations. 8. By requiring that Sciame deed the open space instead of restricting it by easement as allowed (in a section of town) regulations. 9. By requiring that the applicant provide over 31% of the property [to open space] when its regulations only call for 20%. 10. By deliberating and discussing the motion to approve in Executive Session, it deprived the public the opportunity to listen to it reasoning, and there is no record of its reasons for the court to review and contrary to the Connecticut Freedom of Information Act. The neighbors final charge regarding the Commission’s decision to go into a closed, Executive Session, when it discussed the merits of the application, could well be one of the arguments that could persuade the Superior Court to invalidate the Commission’s mandate for “public access” on the development site. 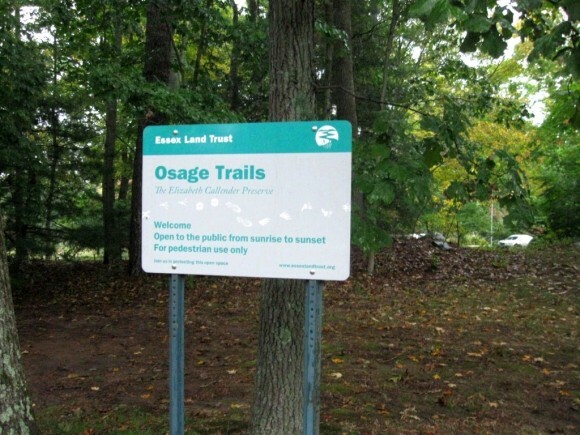 However, Osage Trails, which is the town park referred to, does require a long walk before a visitor can reach the waters of the cove. Also, the view from the Osage Trails lacks the sweeping view of North Cove that would exist from the Commission’s “public access” corridor of the development. Also, the neighbors’ argue in their lawsuit that, “Additionally, there are 12 Public access ways to the coves and rivers in Essex including four between the Property and Main Street Essex, which is approximately one mile south of the Property.” Basically, the neighbors charge that the Town of Essex already has enough “public access” open spaces in town, and does not need another. One of these existing “public access” sites is located just off Teal Lane in Essex. This truly excellent “public access” open space has a boat launch, boat racks and an elevated wooden sitting and viewing area. Also, there is plenty of room for parking, and there is a latrine on the site. 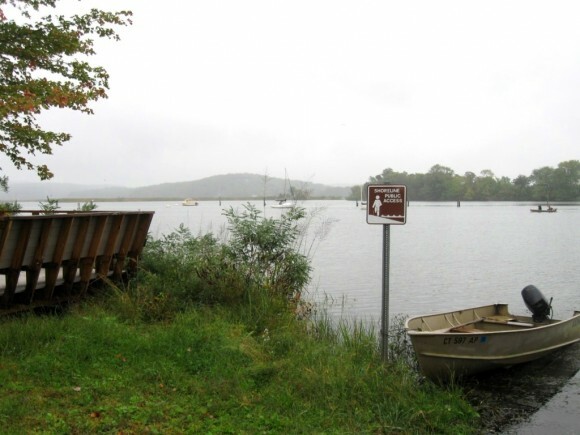 However, even this fully equipped, “public access” site does not offer the sweeping views of North Cove, the Great Meadow and the Connecticut River that a “public access” corridor on the Sciame development would offer. In the Commission’s approval hearings Sciame went so far as to offer a visual “public access” easement from Foxboro Road to the North Cove below and beyond. In short, the waters could be seen but not walked to. However, this alternative was rejected by the Commission. Still, indisputably, the Commission’s “public access” corridor at Foxboro Point, would uniquely offer a visitor the joy being able to walk down and back to the waters North Cove. However, as is evident by this lawsuit, the neighbors would not like it. The International committee of the Tri-Club Chester, Deep River and Essex Rotary clubs met at Chester Village West recently to learn more about the Sister Cities Essex/Haiti project to build a library in Deschapelles, Haiti.